Travelling around the country fixing gas leaks! Working as part of a team, providing gas maintenance to our clients, which includes commissioning, de-commissioning, full asset overhauls, functional checks and cathodic protection readings, to name just a few! How did you start your career and what is your advice to women who want to work in STEM? Advice to other females in this industry – just do it, hold your own and take every opportunity that comes your way! What are you most looking forward to about working in your new role and what will be the most challenging about it? I’m really looking forward to improving my technical capabilities and knowledge with further on the job training, as well as completing my NVQ in Engineering Gas Maintenance at our workshop in Neath. This will certainly be no easy feat! 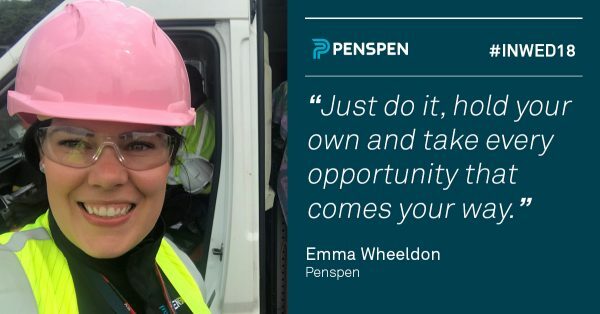 What do you enjoy most about working for Penspen? The people, working as part of a great team, amazing opportunities, new challenges, varied work, working in different locations across the UK… and driving a van. What does it mean to you to be one of few females working in this type role across the industry in the UK? I feel proud to be part of a company that strongly promotes equal opportunities for all. I have really appreciated the support that Penspen has given me. How does this role differ from your previous experiences? The majority of my previous work has been office based, now I am driving a lot, working with tools and trying to be technical!